Trump campaigned on a promise to keep jobs in America, but many wondered if he’d actually be able to fulfill this promise once he was in office. His latest move puts that question to rest. Trump has convinced an accordion player not to move to China. Love him or hate him, you’ve got to admit that he’s making good on his campaign promise to keep American jobs from being shipped overseas. As soon as Trump heard that a Cleveland-area accordion player named David Gorski was considering a move to China, he immediately met with him to try and talk him out of it. During their meeting at the White House, Gorski expressed his motivations for moving to China, which reportedly included an offer from a friend in Beijing who needed an accordion player for his band as well as the fact that he’d “just been in Cleveland for a while now.” Trump spent the afternoon in tense negotiations with the musician, who typically gigs around the city and is available for birthdays, bar mitzvahs, and weddings. After several hours, Trump emerged with Gorski and announced that the Cleveland accordion player had decided not to move to China after all. This is a big win for the Trump team, and it shows he’s serious about safeguarding American jobs. 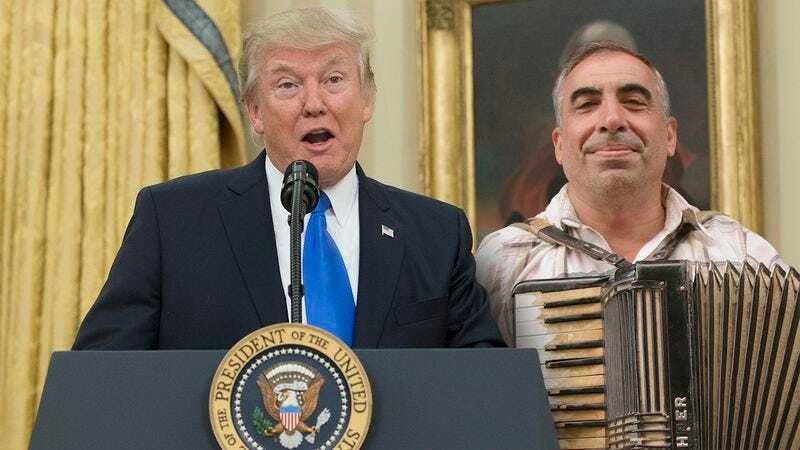 According to White House officials, the accordion player’s decisision not to move to China was the result of a deal that Trump was able to negotate with him. The terms of the deal state that Gorski will go on vacation to China for two weeks, at which point he will return to Cleveland for the foreseeable future. The deal also includes a tax break and an invitation to perform at an upcoming Polish heritage dinner at the White House. Despite criticism from Democrats that the accordion player wasn’t ever that serious about moving to China, Trump supporters are likely to see this as Trump walking the walk. It remains to be seen if Trump’s deal will convince other accordion players considering moving to China to stay in the U.S., but one thing’s for sure: This is a major victory for the new president.